Whirlwind romance, expectations, separation, forlornness, depression, longing, friendship, betrayal, being protected over by family and unlikely angels is what follows in this roller coaster ride of love and emotions. Though the plot is simple and gets predictable at times, it was Preethi’s narration that came above it all. 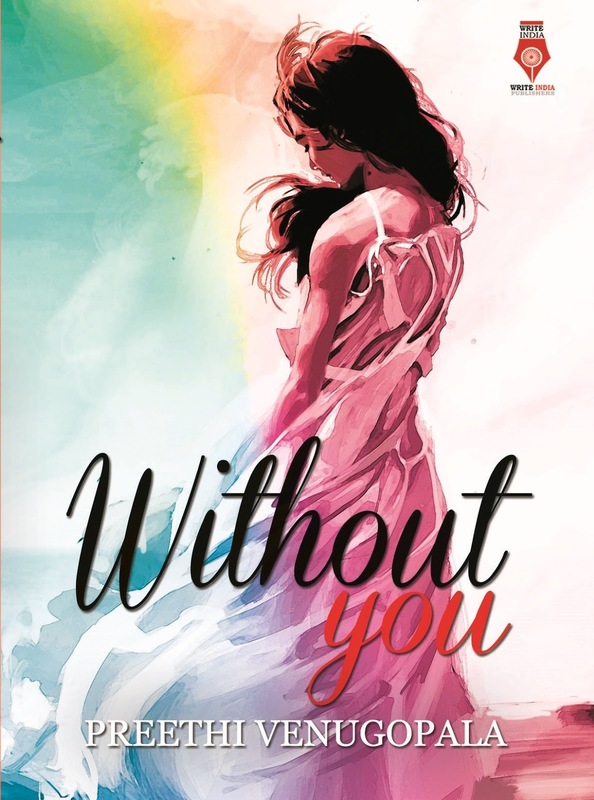 Her flowy-style, beautiful portrayal of emotions, usage of imagery, everything about her writing makes you love ‘Without You and every word in it’ even more. You see, read, and feel the story through Ananya’s eyes. It makes you laugh, cry and relate to her. And As for Arjun, he will have you at hello. He reminded me a bit of Fitzwilliam Darcy, which I suspect was on the mind of Preethi while creating this dreamy Cancer man in love. The characters of Anu’s friends and cousins are a smooth fit in the story and are easily likeable. When I first saw Colonel R.S. Nair talking to Anu, I hope his character would be something more than a mere onlooker; and it turned out to be true. His secret was something unexpected but I love how he guarded Anu, from time to time. ‘Without You’ made me nostalgic and took me land of all my favourite characters and books in some or the other way. Preethi talks about reincarnations and celestial connections to explain the concepts of love at first sights and soulmates, which worked out because, she made it look believable. It reminded me back to the days when I obsessed over Coelho’s Brida for a while. Another thing I absolutely loved was how she began every chapter with a quote to set the mood for what we were about to read. It worked! There are very few things that I didn’t like in the story. However, they are so puny compared to the beauty of Preethi’s words and narration. The narration flowed smoothly but there are print errors at a couple of places that distracted me for a bit. At some points, I find Arjun’s way of addressing too sappy but Preethi made up for it with his charisma and undying love for Ananya. I wished there would be some bickering between them during the reconciliation, but that didn’t happen. Anyway, it made me happy that they overlooked anger for love. Preethi did a better job as a debutante than many writers we see today. Love flows in her words. Ananya made me laugh and cry with her, Arjun made me swoon over him and Sreepuram made me yearn to go back to my Ammamma’s place which is a picturesque village nestled on a river bank. Only if I could get someone like Arjun there. Over all, it is a perfect pick this monsoon if you are a lover of Romance. Cuddle up to your couch with a cup of coffee and escape into the world of Ananya. You will not be disappointed!